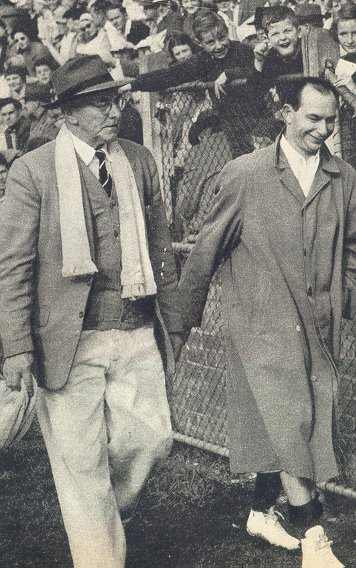 Harry Beitzel leaves Glenferrie Oval after suffering a leg injury in 1957. Harry Beitzel, the 1955 VFL Grand Final field umpire, VFLUA president, life-member, achievement-award recipient and hall of famer, as well as, director of umpiring, passed away at Gosford Hospital in NSW in August, 2017. He was 90. Harry was like most umpires in that he loved various sports. Cricket was one of them. Like all cricketers, he would have loved to have reached the ton, in this instance, a century of life. But some of the shots he played to get to 90 were innovative and a few of his drives and pulls during his umpiring career were classics: “The Three Cs of Communication are …”, Aitch, short for Harry, would espouse before rolling out his “Four Ps of Preparation”. Then there was Harry’s take on how umpires were to get side-on to view play: “Run along the lines of an imaginary diamond on the field”. It’s probable Aitch thought of this metaphor of “diamond running” when the VFL introduced the centre diamond in the early 1970s. But, when it came to football, and in particular umpiring, Harry was full of ideas. The introduction of multiple field umpires came about after he witnessed the speed of the game increase during the late 1960s through improved athleticism and the use of handball. He wanted umpires to be better remunerated (Harry had two bites at this, once in the 1950s when he was VFLUA president and when he became director of umpiring in late 1979) and he had a hand in introducing body signals for decisions. He wanted goal umpires to wear cameras for TV replays and set the non-official minimum age for a field umpire’s VFL debut from his late 20s to his early 20s. He also believed that if a field umpire was an extrovert he should not be selected in case he had a big head and this could compromise his decision-making process (some self-reflection perhaps for Harry after he cheekily introduced Allan Nash on a sports-talk show in 1956 as his emergency for that year’s grand final – in fact the umpiring board had appointed Nash as the man-in-white). Harry suggested that umpires carry pencils and paper in pockets for making reports and to also mark down the better players each quarter who received Brownlow votes, had umpires appear on a World of Sport segment called What’s Your Decision?, halved the number of free kicks awarded per game, had umpires participate in personal-development programs and attend football clubs’ training sessions. Harry continued to criticise umpires live on 3AW but he would defend them too (as he had done during broadcasts). Guest speakers, such as, Bob Ansett, Bob Hawke and Andrew Peacock were happy to address umpires on pathways to success. Harry had favourites on the field. Coleman, Lahiff and Sheedy were matched by umpires Irving, Crouch, and James. Aitch had dislikes too: undisciplined clubs in the 1970s, which made officiating dangerous, players who milked frees (“I wish I were still umpiring – they’d be out of the game”) and, the shocking facilities spectators had at grounds, which were matched only by the poor quality of the umpire rooms. “How can you treat people like this and expect them to turn up?” he often asked. Harry was born in 1927 in Fitzroy, a son of returned WWI soldier and VFL footballer Arnold and wife Rita. One of the constants of coping during the depression days of the 1930s was sport. The Brunswick Street Oval was the place of refuge. Harry played one game for the Fitzroy Cricket Club as a batsman, and a handful of games for the Fitzroy Football Club seconds as an 18-year-old. Working at Shell at the same time in 1945 was umpires secretary Ron Woolley, reported historian Don Casey. Woolley pitched the benefits of being an umpire, which included a pay cheque that was bigger than Harry’s wage at Shell. Thoughts of breaking into VFL firsts as a player soon metamorphosed into umpiring at the same elite level. To get to the MCG in September umpires had to do apprenticeships and Harry blew the whistle around Australia, which included a remarkable 21 country grand finals. Away from tearing both of his Achilles on separate occasions while umpiring, and an umpires’ board divided over Harry’s unique approach to umpiring (not the last umpire to state this in our unique sport). Perhaps an insight into Harry’s warm relationship with umpiring is worthy as a conclusion. Harry’s career had him mixing with all levels of society: PMs to battlers where the lexicon of footy made for connection. But if there were two places where Harry was most content, they would have to be broadcasting from the MCG and mixing with umpires at social events, such as, the annual family picnic. At the age of 87 Harry developed a cancer behind one of his eyes. Treatment to stop it spreading was successful but it cost him his sight from the affected eye. “One eyed – been called that,” Harry chuckled, but, “you’ve got to look at life from different angles”. Harry is survived by his second wife Carolyn, daughters Julie (husband another Harry, grand-daughters Sally and Emma), Kerrie (grand-daughter Izzy, husband Shane, and great-grand-daughter Heidi; and, grand-son Andrew) and Cherie (husband Ross) and son, Brad. Written by Harry’s on Brad Beizel .A journalist for many years, Brad was on the VFL umpires list in 1982.